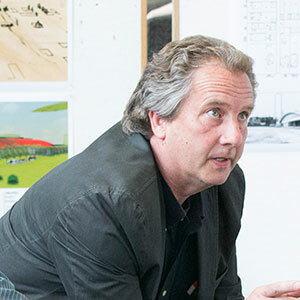 Professor Matthew Thomas Jarosz is best known for his architectural design work related to historic preservation. By combining his teaching and research with his involvement in community preservation projects, he has provided extensive opportunities for students to apply and expand academic learning. His private practice, JaroszLynch Architects, has offered students important hands-on education in the matter of professional preservation activities. Matt’s students are challenged to understand preservation as a philosophical as well as technical field. His courses and research have included all areas of preservation from public policy, building documentation, heritage identification, preservation guidelines creation, conservation techniques, adaptive reuse, and economic feasibility. Matt has served as the coordinator of the Certificate in Preservation Studies program at SARUP since 2001, a focused area of study for Masters of Architecture students. Matt has also chaired Milwaukee’s Historic Preservation commission several times over the past 16 years of service. As heritage preservation continues to expand throughout the world, Matt has focused his research and teaching interests on the matter of international initiatives and collaborations. While European-based attitudes about preservation are at the core of the program, Asian approaches are becoming an important field-study option for students. Since 1996 Matt has offered summer preservation study trips to Japan and Italy for 3 to 12 credits. These international collaborations have created student and instructor exchange programs with universities in each country and have included building documentation, restoration workshops and design interventions. Along with coordinating the Historic Preservation Certificate program at SARUP, Matt also created and directs the Historic Preservation Institute. The HPI exists as an opportunity to extend preservation research and education by providing outreach to community organizations interested in completing preservation work that is traditionally outside the scope of private architectural firms. Private and public organizations throughout Milwaukee have contracted with the HPI to complete a variety of preservation advocacy activities. Through the institute students have been able to earn credits towards their preservation certificate as well as expand their understanding of historic preservation.